Josephine Ethel (Josie) Wood was born on 22 January 1874 in Grahamstown. She was one of the six children of the first mayor of Grahamstown, George Samuel Wood, and his wife Frances Elizabeth Wood (nee Hoole). Her grandfather. George Wood, was an 1820 settler and member of the Legislative Council. After matriculating at the Diocesan School for Girls in Grahamstown, Wood was trained as a teacher. Initially she acted as tutor for two cousins in Johannesburg before leaving for an extended tour of England and Europe in 1909. On her return she settled in Grahamstown and became active in the work of the Child Welfare Society. She also nursed invalids in her own home. She continued with this until the Great Influenza Epidemic of 1918 when she met Eleanor Comber. Comber came to South Africa to work among the blind. To combat the high level of illiteracy she taught braille and acquired a small if books in braille. When she decided to leave South Africa in 1918, she looked for someone to take over her work. She turned to Wood. In March 1919 Wood started with her work among the blind. She stored in her own home a 100 braille volumes, canvas bags for mailing, and the names of 20 people interested in borrowing books to read. All administration was done from there as well. During the first year she raised funds by selling her own sketches and paintings, while well-wishers and readers a money.A next step was to start a transcription service. Her niece, Edith Wood, was the first voluntary transcriber. Wood herself also learnt braille. However, the demand for books in braille exceeded the numbers the volunteer transcribers could produce. 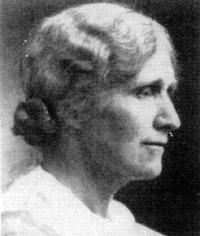 She therefore appealed internationally for contributions and in 1921 received supplementary stock from the American Braille Press in Paris, France, the National Institute for the Blind, and the National Library for the Blind in London, England. The arrangement with the latter library continued for many years in the form of so-called block loans of 80 titles at a time. Wood also induced the national and provincial governments to make substantial contributions for books for the blind. Wood's lobbying for assistance included transport of items for the library. The Union Castle Shipping Company responded by transporting the contributions and loans from overseas institutions free of charge. The postal services lowered the postage payable on items for the blind. Eventually, in 1953, it was decided that no postage would be charged on any item to and from any recognised institution serving the blind. By 1924, only five years after Wood had started the library, it had grown to such an extent that she decided to get assistance. Staff were appointed, and a deed was drawn up which called for a council to govern the library. Also in 1924 a bequest from the Rhodes University Council facilitated the erection of the building in High Street in Grahamstown which would house the library in future. In 1925 the South African Library for the Blind was officially opened by R.W. Bowen, then member of the Cape Provincial Council. Wood was honorary secretary of the library council for 46 years. In 1929 Wood was a co-founder, with Bowen and others, of the South African National Council for the Blind (SANCB). Several awards and honours were bestowed on her in gratitude for her services. In 1952 she was appointed first honorary life president of the SANCB, and in the same year was awarded an honorary M.A. degree by Rhodes University, Grahamstown. In 1955 the Rotary movement awarded her its Token of Esteem; in 1961 she was made an honorary Fellow of the South African Library Association (South African Institute for Library and Information Science); in 1962, when the Grahamstown Municipality celebrated its centenary, she became the first person to receive the Freedom of the City; and in 1963 she became the first recipient of the R.W. Bowen Medal for lifelong and meritorious service to the blind of South Africa, awarded by the SANCB. After her death in 1965 a commemorative plaque was unveiled in the library, and on 11 November 1966 J.M. Hyslop, then vice-chancellor of Rhodes University, opened the Josie Wood Wing in the South African Library for the Blind. Wood never married. She died in Grahamstown where she had spent most of her life.